Hello my pretty ladies! Hope you all are doing well. I have been away for a while from here, but it feels superb to be back again. The past week has been really tough for me – professionally and personally but thankfully I had my closest buddies who were there for me through thick and thin. Coming back to the magical world of beauty, I am here with a DIY. Well, who doesn't want perfect hair day for the special occasion? 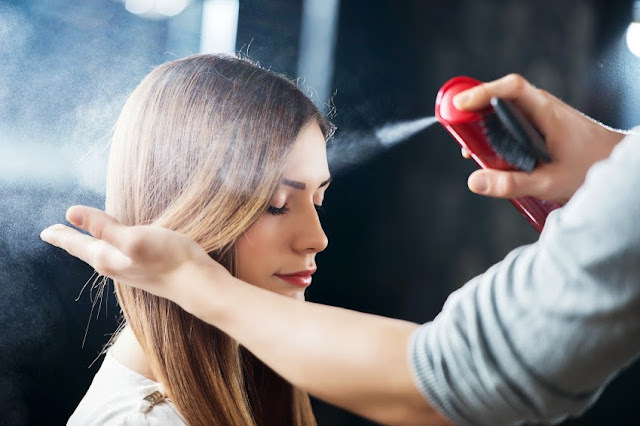 Unfortunately, the heat styling products can do some real damages to our hair if proper moisturization is not provided. The last time I bought a heat protectant spray, it actually did nothing to my hair. I did a bit of research on the protectant sprays which led me to the conclusion that the spray is nothing but added moisturization. So I tried my hands on it but I failed twice. On my third attempt, I got the ingredients right and it worked wonderfully for my hair. The key of the spray is to understand your hair type and get proper ingredients with the right amount. So let's get straight to the DIY. Any conditioner/dry hair oil/hair serum. Fill half the bottle with distilled water. Add 2 tablespoons of the conditioner of your choice. If you are using hair serum, reduce the quantity of water and add water is to serum in 1:3 ratio. If you are using dry oil/oil serum, the water-oil ratio should be 1:1. You can increase the moisturizing content according to your hair type. Add 10-12 drops of almond oil. Now, add 4-5 drops of castor oil. As the castor oil is heavy, I have restricted it to few drops. You can even add 3-4 drops of grape seed oil, however, this is optional. Shake the bottle and you would notice slight foaming layer on top of the bottle. And your heat protectant spray is ready. I chose the conditioner because my hair is moisturized in summer days. If you have dry hair, you can try the dry oil method but restrict the almond and castor oil quantities to 2-3 drops as you are using the dry oil already. It is very important to understand what your hair type is and how it reacts to the heat. Make sure the spray isn't too oily. Use sparing quantity for each hair section. Let your hair absorb it for a while and get completely dry before using the heat. Make sure you give your hair a thorough oil treatment before and after using heat and keep it well moisturized. Heat can damage the hair in the long term so keep it minimal and use only when required. Do let me know how it worked on your hair! Wonderful DIY which is ideal for hair care. Great one .. it would save us so much money..